All it takes is some creative Facebook marketing ideas, and you can win the attention of your customer. A restaurant’s social media demographic typically consists of hungry consumers seeking out their next meal. Pair that with people’s tendency to buy from companies they see on social media and the need for Facebook becomes clear. According to Sprout Social, 75 percent of people have purchased a product because they saw it on social media. Of that percentage, 60.7 percent need to see that product 2-4 times before they make a purchase. Let’s take a look at some of the easiest, most creative ways your company can utilize Facebook to fill tables. It’s important to get creative and avoid a straight promotion. Your chef works hard to make sure every dish looks great as it leaves the kitchen. Why not utilize the services of your patrons in promoting that hard work? A photo contest may be just the trick. Get your customers to pull out their phones and take some creative shots, and hashtag them with the name of your restaurant. The photo with the most likes or shares wins. You could also share them through the restaurant Facebook page to tally likes or shares. Make sure there’s a nice prize incentive for the winner! It’s important for restaurants to remain rooted strongly in the local community. When a high school, college or pro sports team does well, you can post about it. When the weather is cold, remind people where they can get a coffee, hot chocolate, or warm bowl of soup. Keep current with your local newspaper. It can give you any number of ideas for creative tie-ins, to post about. This is, of course, a play on the Dos Equis character. 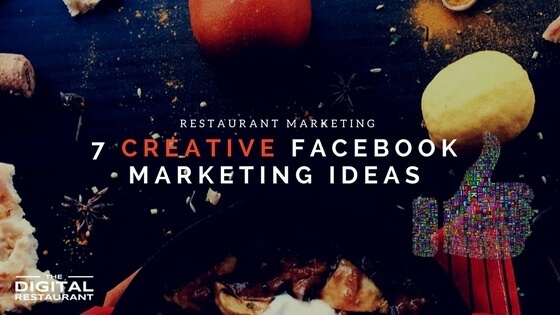 But you can offer food and beverage pairings, run promotions for national food days, talk about the background or ethnicity of your food, or find any other number of ways to turn your Facebook page into an engaging conversation versus monotonous advertising. The point is to have fun with it and get people talking. In order to do that, you have to engage people in worthwhile conversation. Let’s say your restaurant wants to promote healthy eating. You could run a community contest for the best healthy recipe under a certain number of calories. You can invite high profile judges from around the community to come in and judge each recipe on taste. Now you have a high-profile event, geared at promoting healthy eating and lifestyle. That’s something you can invite your local news to cover. Once the contest is complete, you have a community-invented dish that your restaurant can serve and promote, as a way to encourage healthy eating. It’s a win-win. You can promote the event on your Facebook page in advance, take lots of great photos of the contest itself, and continue to promote the dish afterward. The press story is also something that can garner attention. The recipe contest doesn’t have to revolve around healthy eating. That’s just a way to establish a deeper interest with the community. Social media users love value. While meal coupons are great, there are ways to provide your users with a longer, lasting value. You can give away recipes. This can help strengthen the bond between your restaurant and loyal customers. Instead of just posting a recipe card – you could post a cooking show styled, how-to video from your chef. Your Facebook fans would love it. The dishes don’t have to be your signature dishes. Is there an appetizer people love? Whatever you choose, your Facebook audience will likely be appreciative. This is an easy way to stay visible on the Facebook page. Share your best, or most creative reviews. There are billions of Facebook video views every day. You can post videos of your chefs in action. You could stick a Go Pro on a hard-working waiter. You could use video to promote events. It’s a great way to get people to engage. Take a look at the Facebook marketing ideas above, and think about which ones mesh with your audience needs and your skill set. Chances are, you could be doing something to improve your social media presence and bringing more people through the door. You don’t have to navigate the social media landscape alone. We’ve helped several restaurants improve their social media presence. A free consultation is a phone call away.